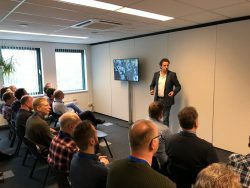 On Wednesday March 20, Kiwa Telefication organized their first Wireless Electronics Approval Event at the headquarters in Zevenaar, the Netherlands. It was a successful first edition. In an ever-changing world, where more and more products will use different types of connectivity, it is important that these products comply with all regulations. Which rules must your product meet? From a Kiwa Telefication point of view we showed how we can support you as a manufacturer. At the event it was possible to meet the experts and get to see the Wireless and EMC testlab. The first guest speaker was Marco Heida, the expert on the Internet of Things (IoT) in the Netherlands. IoT stands for (temporarily) connecting devices to the internet in order to exchange data. The expectation is that in 2022 even 95% of the new products on the market will contain IoT. Examples are smart thermometers, refrigerators and sports clothing with sensors. Marco Heida explained in his presentation how you can offer added value for your customer with IoT, but also what the risks are that come with it. The second guest speaker was Jean-Paul van Assche, who works at the Dutch Agency of Telecom, and told about the European regulations regarding the use of radio frequencies. He also explained the rules a new product should meet when it is put on the market and how a Notified Body can help you with that. Willem Jan Jong and Rick Wesselink from Kiwa Telefication elaborated on this. What do you have to take into account as a manufacturer? What is the time to market? What do you do if there are no standards available? But above all, what can Kiwa Telefication do for you as a manufacturer..
Telefication is an independent testing, inspection and certification (TIC) company, specialising in electronic equipment and wireless technology. By securing the quality of your products and systems we support you in growing your business. Testing and certification is done at our own testlab and we offer an one-stop-shop for worldwide certification. Would you like to know more about our company or do you have a support question? Do not hesitate to contact us!